As the wife of a physician, a high percentage of her clients are involved in the medical profession and have recently relocated from other areas. Over 95% percent of her referrals are from previous clients, appreciative of her personal integrity and staunch dedication. Commended for building a comfortable rapport with those with whom she works, her warmth and enthusiasm are contagious. Her motto ï¿½real estate consultant for lifeï¿½ reflects her genuine desire in establishing a real relationship with each client. Friendship doesnï¿½t end once the deal is closed and Suchita prides herself on helping clients to feel at home in their new surroundings and being available for anything that may come up. Suchita is determined to stay abreast of the latest developments in real estate technology and she possesses a sophisticated and up to date knowledge of real estate home finding and marketing techniques. She has successfully completed the e-PRO training program for real estate professionals, she holds the Certified Residential Specialist (CRS), the Graduate Realtor Institute (GRI) and the Accredited Buyer Representative (ABR) designations. In addition, Suchita has recently earned the prestigious Certified Luxury Home Marketing Specialist designation in recognition of her knowledge and expertise in the luxury home market. To better serve her clients she has added a couple of new members to her team, Lori Bastie as a Buyer Specialist and Shraddha Parikh as a Client Care Coordinator. Never content to be sitting on the sidelines, Suchita is actively involved in many areas of the Munster community. She has served on the Board of the Munster Educational Foundation, The Asian American Medical Foundation and as the Treasurer of the Lake County Medical Society Auxiliary Alliance for four consecutive years. 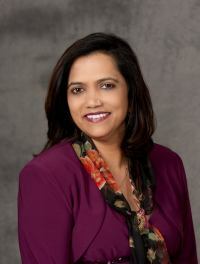 A prominent leader of the Indian Community of Northwest Indiana, Suchita, together with her husband Dr. Harish Shah, played an integral role in the development, planning and construction of the Indian American Cultural Center in Merrillville, and founded the Northwest Indian American Association of which she was an active board member for eight years.